New iOS system always come with new problems, for users who update their iPhone/iPad/iPod to iOS 12 beta or iOS 11.4/11.3/11.2, most of them will meet with some problems. If you are a Bluetooth users, you might also get annoyed that there are also problems with Bluetooth on iOS 11/12. In fact, Bluetooth issues of iPhone come over and over again through this years of iOS update. Luckily, in the following content we will help you to fix this Bluetooth not available problem on iOS 12/11. Go to: Settings > Bluetooth and turn the service off. Then press and hold power button, when you see "slide to power off", swipe it to turn off your iPhone. Press Power button to restart your iOS device and turn on Bluetooth again. Notes: Make sure your Bluetooth is available, problems on Bluetooth cannot be sloved on iPhone and iPhone not connecting to Bluetooth will always exist. You can also choose to connect your Bluetooth with iPhone again to fix iPhone Bluetooth not working after iOS 11 update. Pair your iPhone with the device again. 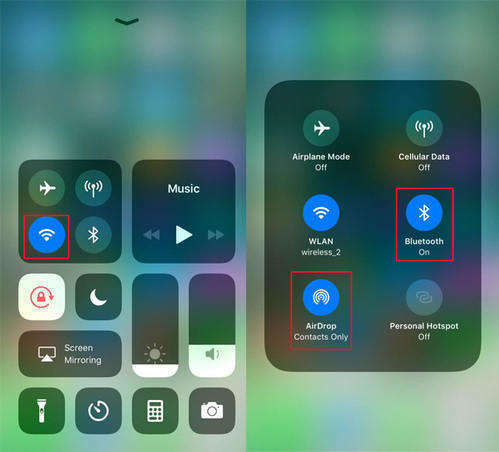 If problems exist in the settings of iOS 11/12 system, you can also get iPhone X/8/8 Plus/7/7 Plus/SE/6s/6/5s/5 Bluetooth connectivity problem fixed by reset network settings. Go to: Settings > General > Reset > Reset Network Settings. Notes: This process will also erase your Wi-Fi networks and passwords, cellular setting, and VPN and APN settings you've used before. If the above tips cannot help you manually handle the Bluetooth problem on iOS 12 public beta or iOS 11, you then can choose to restore your iPhone with iTunes or iCloud. Through this method you can erase the problematic settings on your iOS 11 iPhone. But this solution will also erase all data on your iPhone. You may refer: How to restore iPhone with iTunes/iCloud, and it can help you restore your iOS 11 iPhone without any data loss. If your Bluetooth not available on iOS 11 still exist, you may then try to use third party software to fix this problem. With free iPhone recovery mode software ReiBoot, you can easily put iOS device into recovery mode and bring it back to normal with 1 click. Run Tenorshare ReiBoot and connect iPhone with PC/Mac. Click "Enter Recovery Mode", and click "Exit Recovery Mode" until you see iTunes and USB icons on iPhone screen. Then your iPhone may turn back to normal. Besides, if the Bluetooth connectivity issues on iOS 11 related to your iPhone operating system, you can also use the powerful feature Fix All iOS Stuck of Tenorshare ReiBoot to repair corrupted iOS system to get the problem solved. That's all about how to solve iOS 11/iOS 12 Bluetooth issues on iPhone X/8/8 Plus/7/7 Plus/SE/6s/6/5s/5, if you meet with this problem again in other iOS version, this article may also be helpful.